This personal fan is very cool. Ha, get it?? Very cool?! I crack myself up. 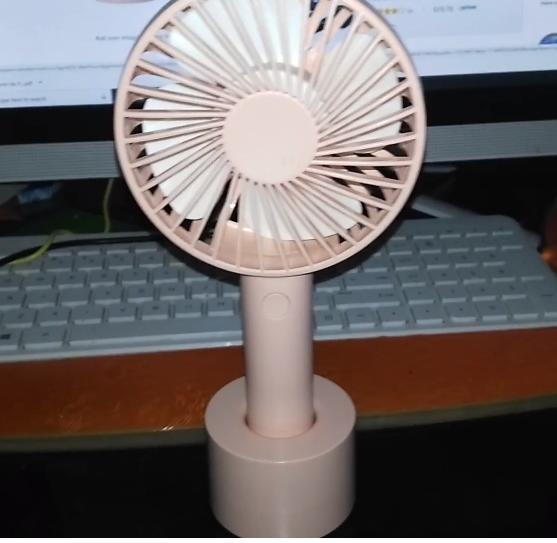 So, I received this personal fan at a discount in exchange for my review. The fan is small. It’s a 4 inch hand-held fan. It’s USB rechargeable so you can take it on the go. It does come with the USB to recharge. The fan is cordless. It also has a handy dandy stand so you can use it hands free. The fan does lift out of the base. This personal fan really surprised me. It has 3 speeds, and it’s really pretty powerful. It will blow your wig off on high speed. My daughter was even impressed and said she wishes we had this fan when our AC went out in our old van last year! I’m using it at my desk. I like having a fan on my while I’m working incase I get hot. I do work from home now, but before, when I was in an office, everyone fought over the AC. Or, if your company was like one of the last companies I worked for, they wouldn’t let you adjust the AC. You had to live with whatever upper management put it on. So, I had a bulky desk fan. This little fan actually blows better than my bulky desk fan, and it’s probably 1/4th the size! When charged, the fan will last from 3 to 10 hours depending on what speed you have it on. It also comes with a one year warranty. If you go to zoo on a hot day, hiking, picnic, on an airplane, camping, or anywhere else you might need a cool breeze, this fan would be perfect! It comes in pink or white so there are color choices available. It runs $15.99 on Amazon.